It’s Time D-Heads! 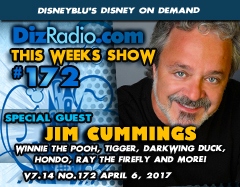 This week we celebrate our Official 7th Anniversary of DizRadio by welcoming a return guest in the iconic JIM CUMMINGS (Winnie the Pooh, Tigger, Pete, Hondo, Darkwing Duck, Ray the Firefly and countless others). Jim talks about his career, Mickey’s Roadster Racers, Darkwing and more! In addition no show is complete without the D-Team and this week to celebrate our Anniversary we are doing the show different than our usual format. Instead of our usual format we are going to invite you to an exclusive D-Team Fireside Chat. We are going to discuss the many years of the show, guests, moments, character mash ups, and more as we sit down with no agenda other than celebrating together this milestone journey together along with you D-Heads! There is news fresh off the D-Wire with the latest news from the Walt Disney Company, but since we are changing formats this week, we instead will take news into a different direction for this fun diversion from our normal format.